The 4th On Ya Bike! for 2018 was scheduled to be a ride to Moriac. However, after finding that the Moriac Store was to be closed for the Geelong Cup, ride leader Dave Simpson, opted to ride to The Cheeky Cow in Collendina. 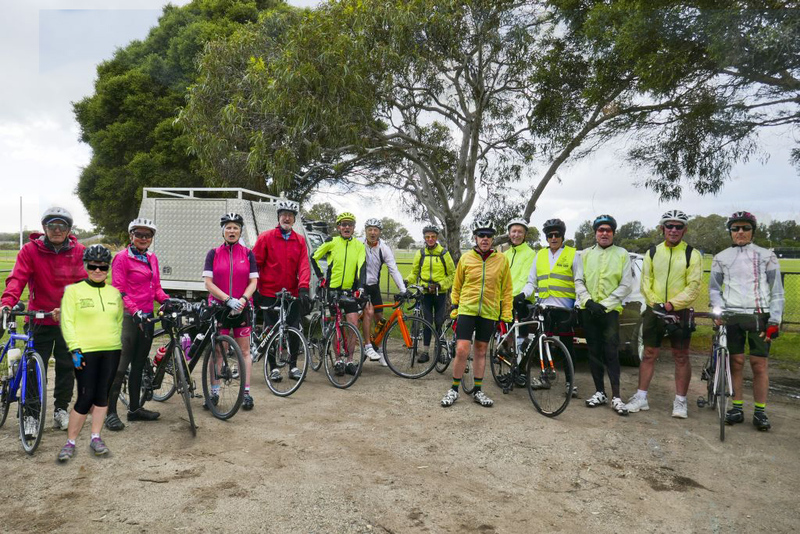 There were fourteen cyclists, who enjoyed the ride along Barwon Heads and Thirteenth Beach Roads to Barwon Heads and Ocean Grove and down to The Cheeky Cow for coffee. Several of these riders had been supporting On Ya Bike! since the very first series in 2008! After a welcome break, the only real hill of the day was tackled – Bonnyvale Road to Shell Road. 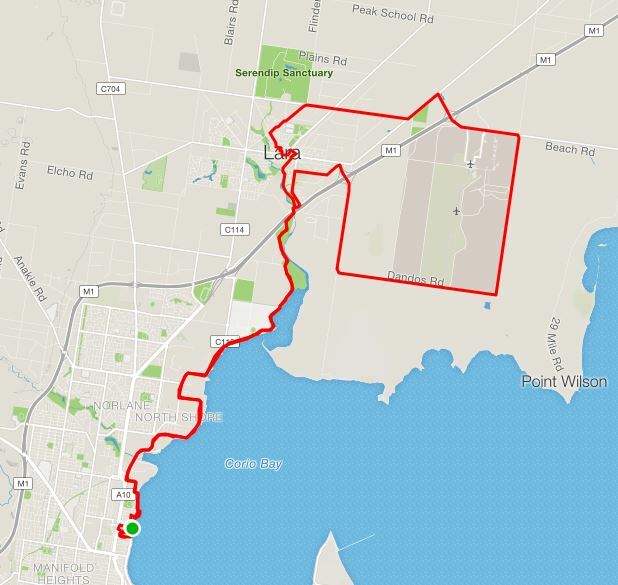 Then it was an easy ride with a tail wind back to the start at South Barwon Reserve. Thanks to Dave for planning and leading the ride and all our On Ya Bike! riders. Next week is the final On Ya Bike! for 2018 – Allan’s Mystery Ride. Please note, this ride begins at 8.30. The starting place is Rippleside Park, and the distance somewhere between 50 and 70km. Thanks to Rod Charles, our cycling historian for leading this ride, and to Hermann who was his excellent tail end Charlie. There were over 30 participants, on a pleasant overcast morning. Rod began with a short explanation of the founding of the area by Foster Fyans. 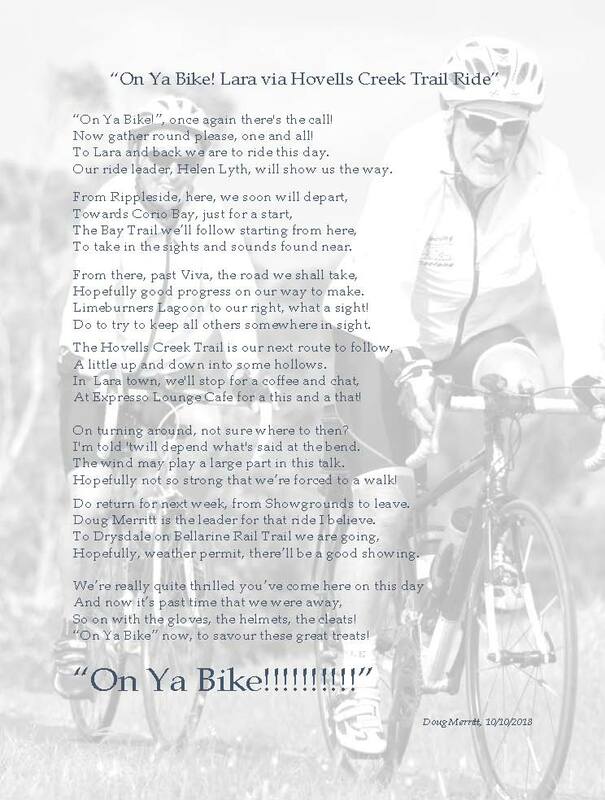 Doug provided light entertainment with a newly penned poem “On Ya Bike! 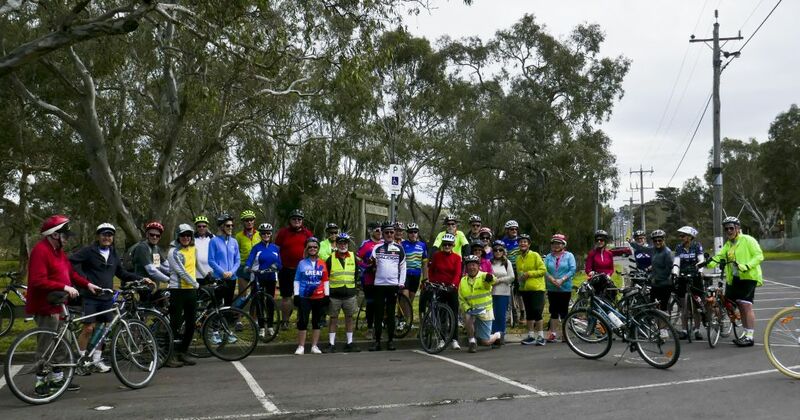 – Barwon River Ride”. There were riders of all abilities and a large variety of bikes – seriously light road bikes, mountain bikes, hybrid bikes, historic bikes like Rod’s Peugeot, at least one e-bike, small wheels, cruisers, Doug’s recumbent Cruzebike and a single speed retro ladies bike. The group set off around the river path in a clockwise direction. Several regrouping stops were held, with Doug giving a progressive rendition of AB Patterson’s “Mulga Bill’s Bicycle”. The river circuits provides lots of options for those who would like a shorter ride. One or two decided to head straight to coffee from the Queen’s Park Bridge. The rest completed the circuit through Fyansford Common. As usual, the service at Barwon Edge was excellent, with the whole group served coffee (and other refreshments) with friendly speed. 2018 is our 11th year of On Ya Bike! as part of the Seniors Festival. With around 100 participants each year, in the last 10 years, we’ve had about 1000 riders. Next Wednesday’s ride in the 2018 On Ya Bike! series is to Lara. The ride begins at 9am, on Wednesday 10th October, at Rippleside Park, near the Adventure Playground. It’s an easy ride, along quiet roads and paths, of around 36km distance. There are a couple of small hills. The ride will be lead by Helen. See you ON YA BIKE! Our very popular ride series On Ya Bike! 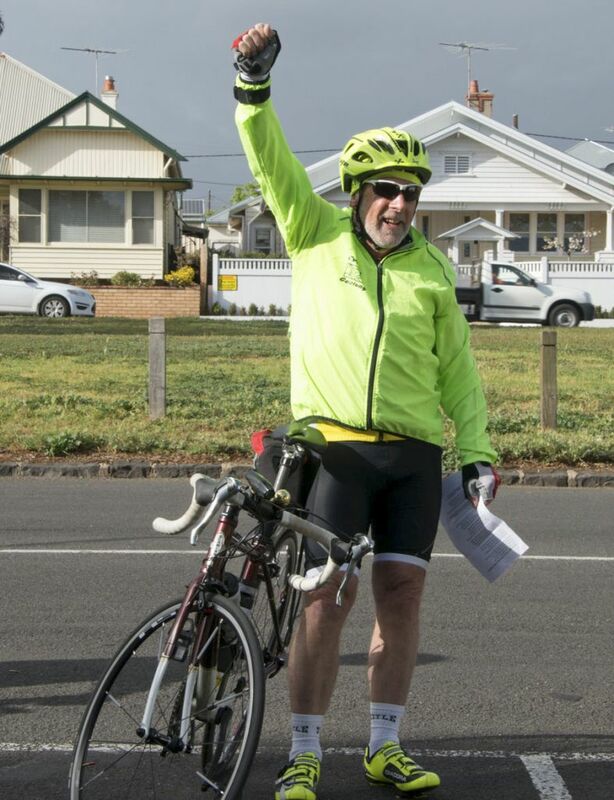 for the Seniors Festival begins tomorrow with History Around the Barwon led by our very own cycling historian Rod Charles. 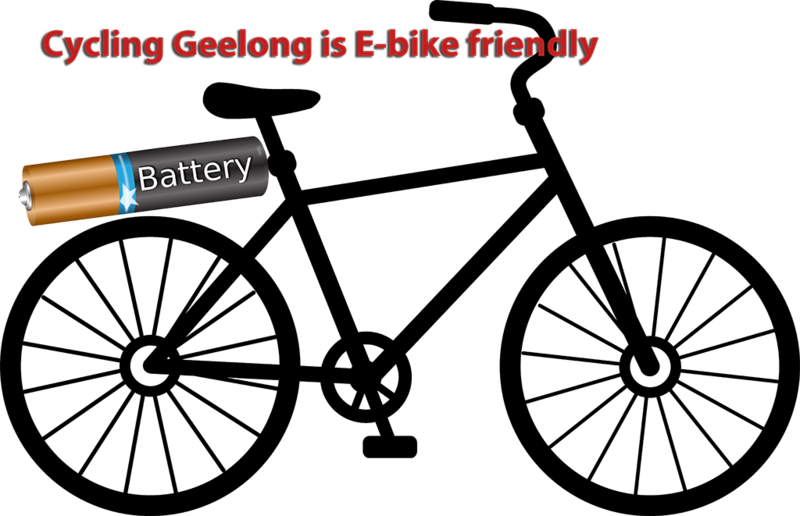 Come along to Balyang Sanctuary car park at 9am. The ride is 20km, with coffee at Barwon Edge. Riders need to be able to maintain an average of around 20kph for this ride. Once again the On Ya Bike! 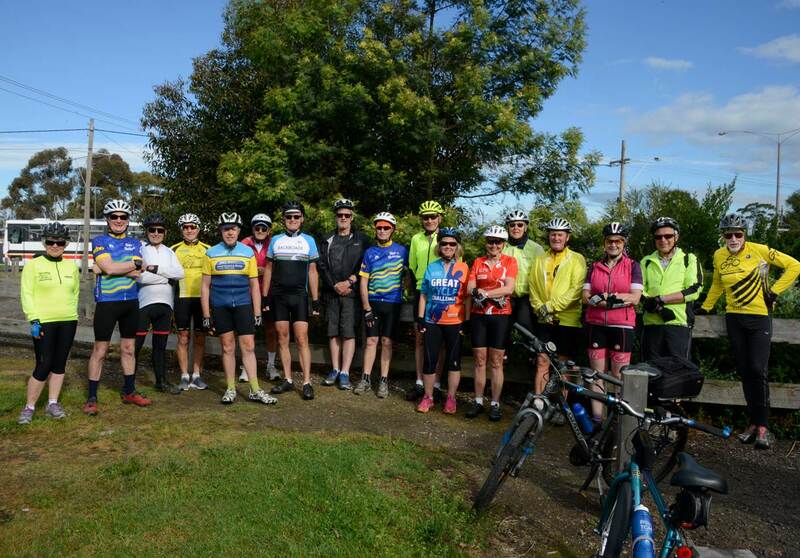 turnout was splendid – 22 cyclists braved the strong wind and icy morning to cycle to Moriac via the old Princes Highway and Mount Moriac, returning via Ghazeepore Road and Grovedale. Helen led the ride. (Click on map for route details) The outward journey was taxing, with the long climb to Mount Moriac made worse by an the unrelenting westerly wind. Most of the height was lost in a wonderful downward sweep on Hendy Main Road, with the promise of coffee and warm at Moriac General Store, which is extremely welcoming to cyclists. Sheltered from the wind, the group lingered in the warm sunshine before taking off to the south and east for the return to South Barwon. With the westerly now a helpful tail wind, the group’s speed and spirits were high, and the return was uneventful except for a front and rear puncture caused by a pothole in Ghazeepore Road – courtesy of the recent wet conditions. In the usual way of punctures, the puncture happened half way up the Ghazeepore Road hill, with no flat surface in sight. 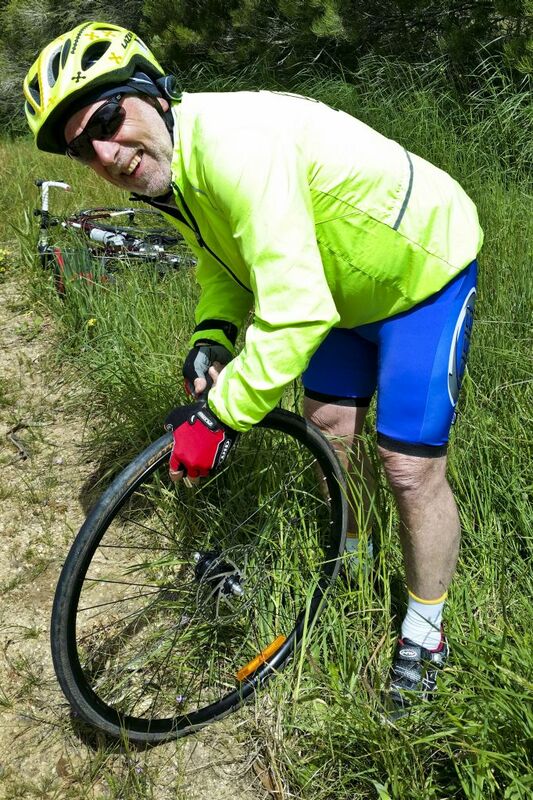 Thanks to Doug (our tail-ender) who mended one puncture, and then waited until back-up “i.e. partner-assist” arrived. Thanks to all riders for making this series so successful. Thanks again to John Hagan for coming along and taking photos. The final On Ya Bike! ride is on Wednesday, October 26th, leaving Rippleside Park at 8.30am. This ‘ultimate’ ride has become a favourite over the years as ‘Allan’s Mystery Ride’. Once again, Allan has selected an enjoyable circuit, with a bit of challenge and an excellent coffee stop. As this is the hardest ride of the series, riders need to be able to maintain an on-the-bike average of at least 20kph and be able to cycle comfortably for an extended distance (usually around 60-70km). As it’s a ‘mystery’, you’ll need to come along to find out more.